For the third week, I choose to do Stuffed Dishes. When I had decided on Stuffed Dishes, I referred to those dishes that are either stuffed and cooked or baked. Ever since I decided on this theme, I have been obsessed with the different dishes that I could make. I had sorted out so many and wanted to make them all. Unfortunately with just three days, I know I have them all pending for the next time. This aloo stuffed karala was something we did on the go. We got the small bitter gourds and were wondering what to do with it. It suddenly struck that we could make a stuffed dish. 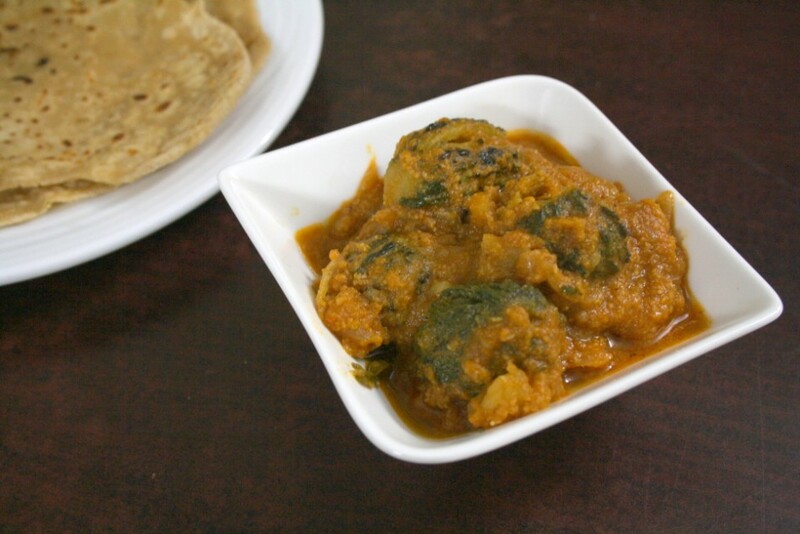 Though scooping out the small karelas are a tedious task, I was happy with the dish turning out well. Boys have their first assessment started this week. I was flabbergasted with the portions they have. They are expected to read a lesson, which was quite a tongue twister for myself. I tried making them read it but with they saying out each and every word, it was a long session and none of us had the patience to continue further. I decided it was enough and should be able to manage. While I am to get the day going, you read and enjoy this dish. Step by Step Picture Recipe. Microwave the aloo for 8 mins and mix in with spices. 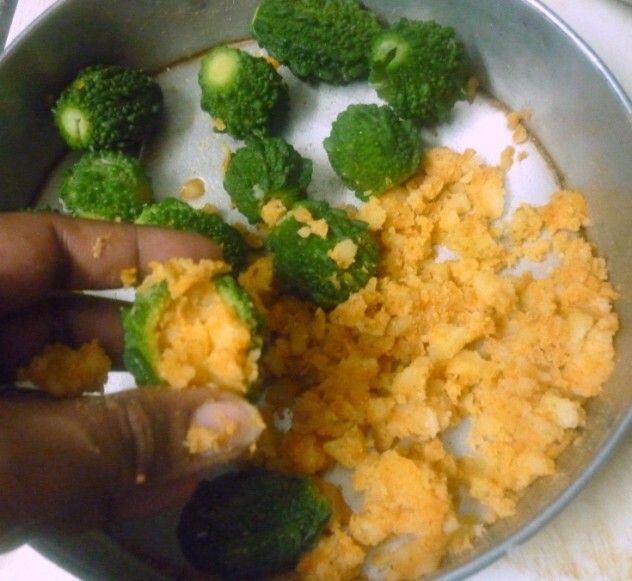 Another method for peeling off the skin, once it cools down, puree the tomatoes. 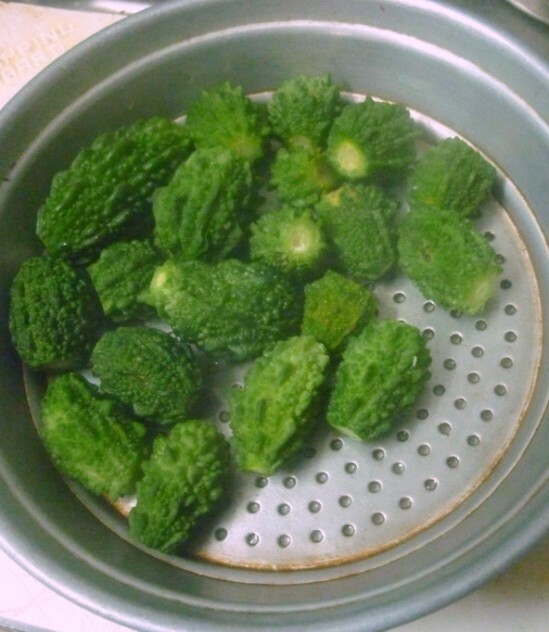 Trim the ends and microwave the karela for 10 mins. 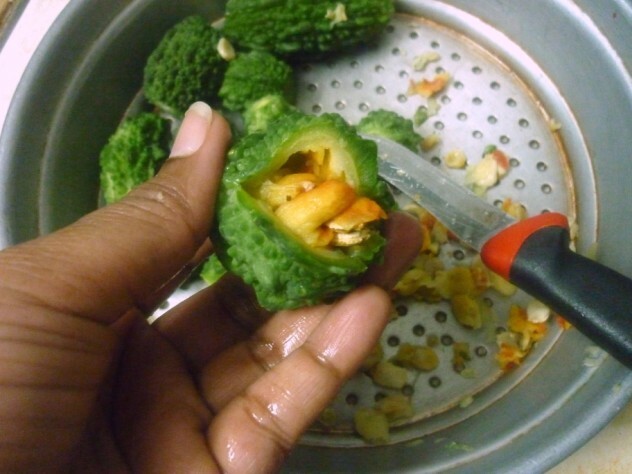 Drain the water, slit the karela and scoop out the seeds from inside. Micowave the potatoes for 6 -7 mins in microwave. Soak and peel the skin. 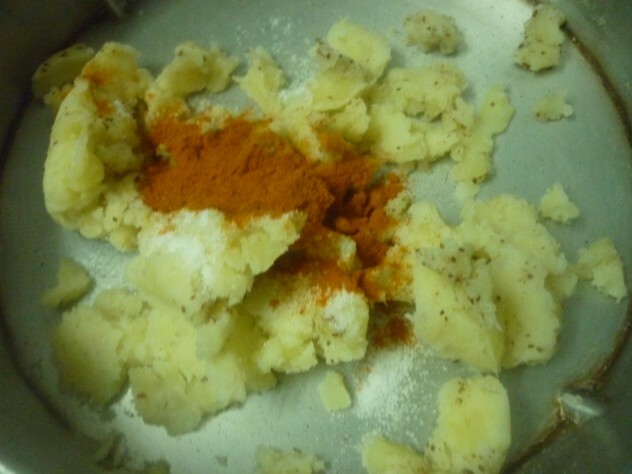 Mash well and mix in the chili powder, cumin powder and salt. Once the seeds are removed the the bitter gourd, stuff the aloo mix inside the karela and close well. Heat a non stick pan with oil, roast the keralas till they turn golden on all sides. For the making the gravy. 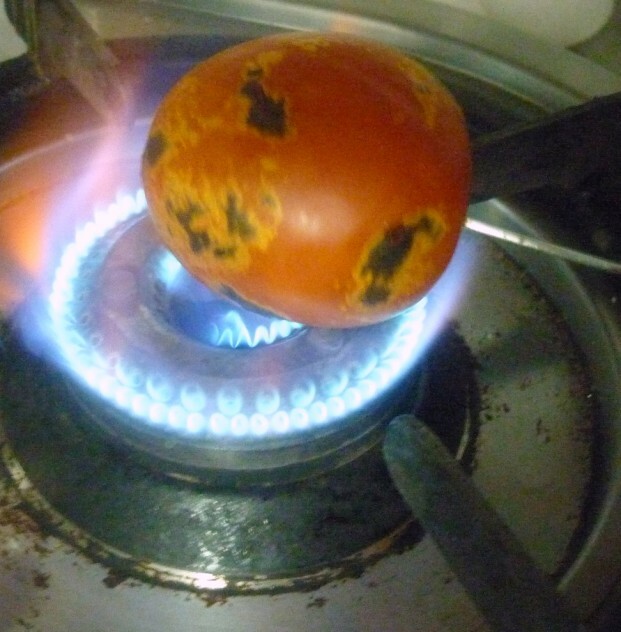 Grill the tomatoes over flame to remove the outer skin and puree. Keep it aside. 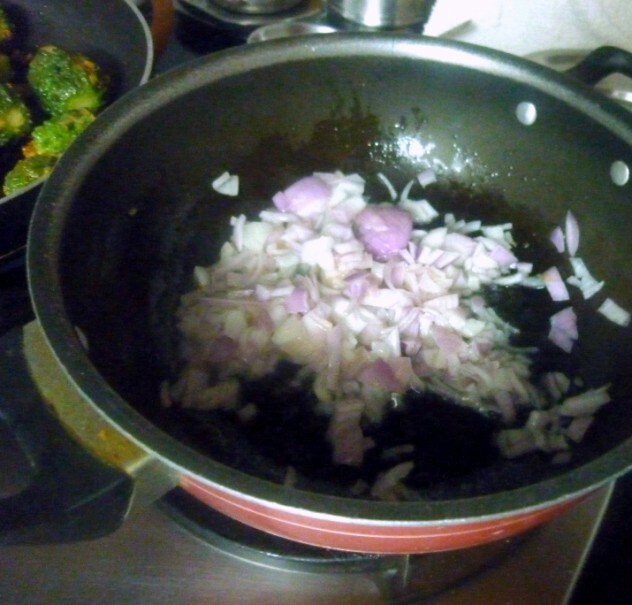 Heat a non stick pan with oil, saute finelly chopped onions. 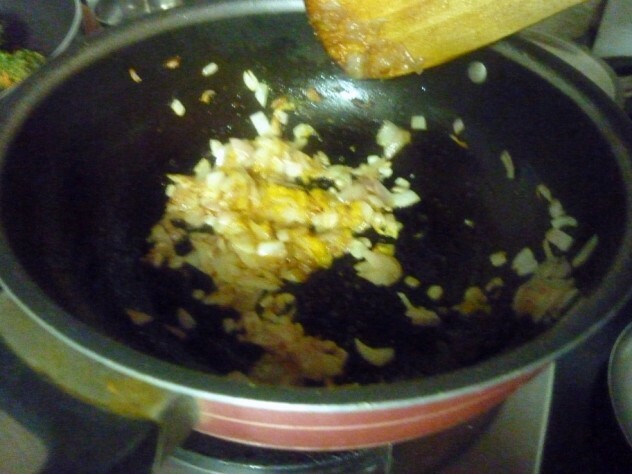 When they turn colour, add ginger garlic paste. Next add the tomato puree, red chili powder and coriander powder, salt and turmeric powder. 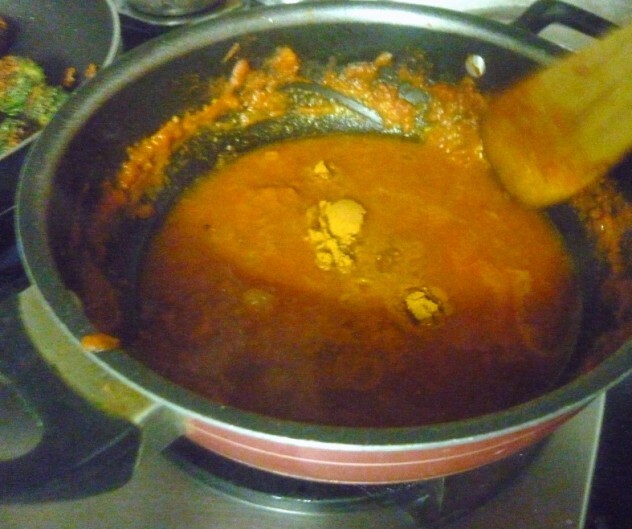 Simmer till the puree is cooked well with the spice powders. 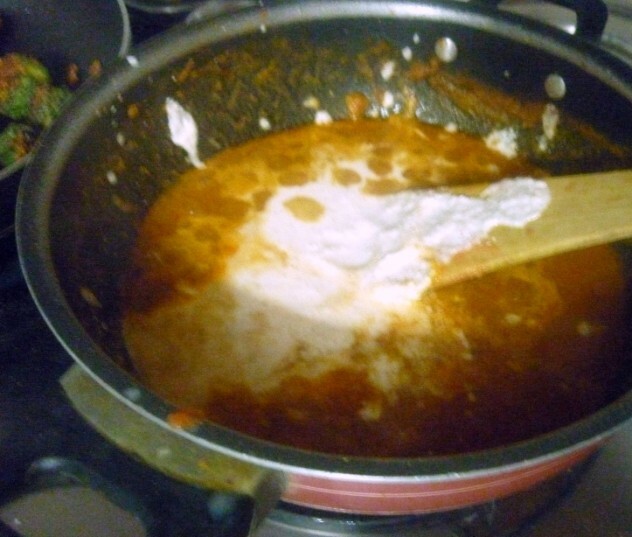 Add a cup of water and then the ground coconut paste. Bring to boil. 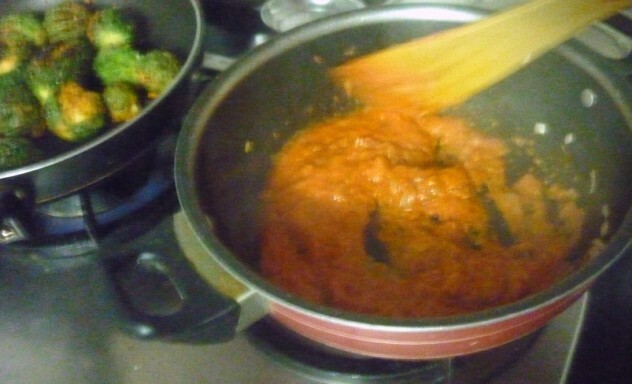 Add the cooked stuffed karela to the boiling gravy. simmer for 5 -7 mins. The aloo stuffed inside the Karela made sure it masks the bitterness and this gravy was good combo with Rotis. 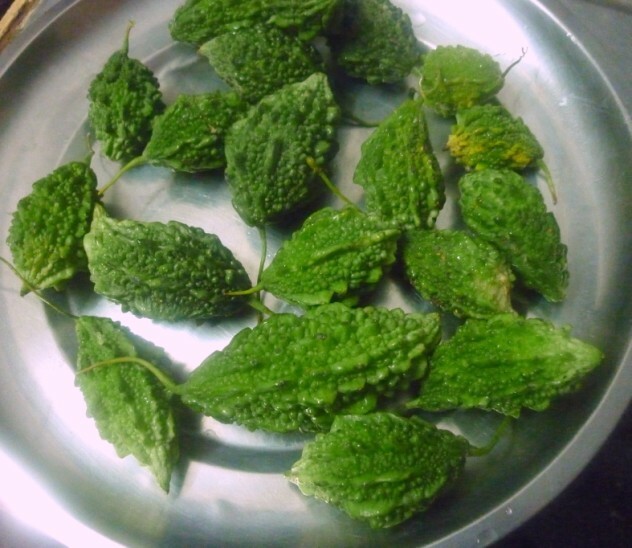 I too make these with potatoes..but never made without peeling..n then in gravy..wondering if total bitterness is masked?..or r they slightly bitter?..will surely try these..I am a great fan of karelas. Stuffed karela looks good! I once made kheema stuffed karela and it was quite an interesting combination. 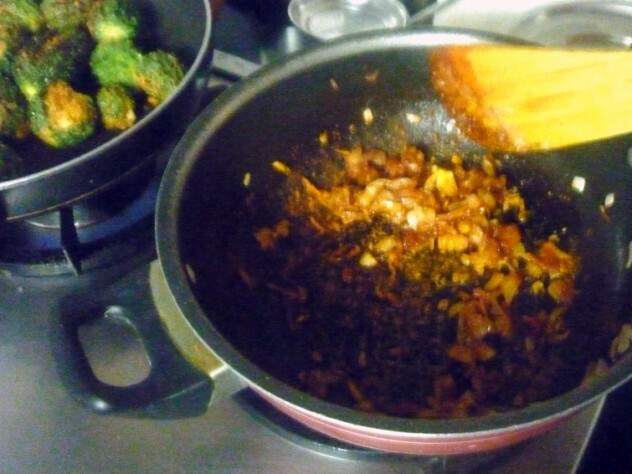 I am very bad in cooking this Karela stuffed curry. Will try this for sure…. My family might love it. 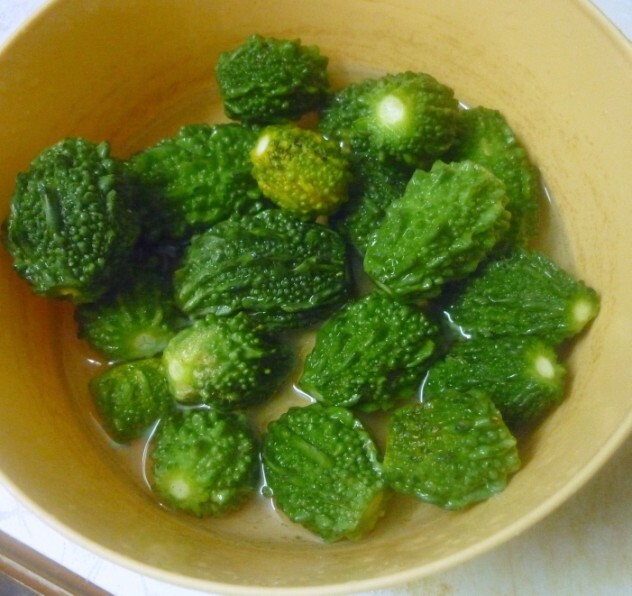 love the idea of stuffing Karela and although I cant bring myself to eat them, hubby would love these ! 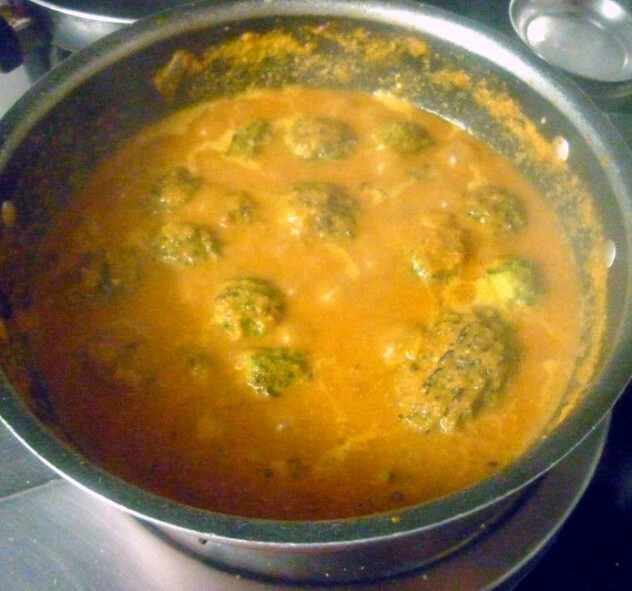 Delicious looking curry..I love karelas and will make it soon. Eventhough i love bittergourd very much,never tried stuffing with them,curry looks fabulous. 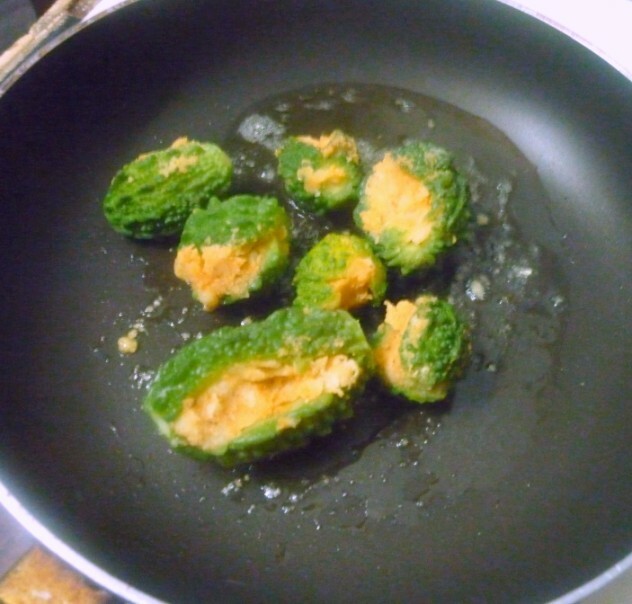 Lovely idea to stuff karela with potatoes…and method to remove the tomato skin is something new to me…thx for sharing. 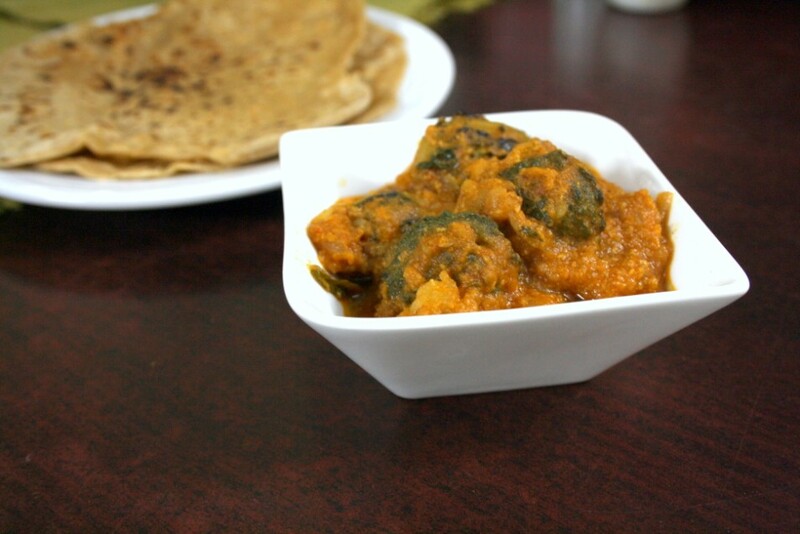 Stuffing Karela with potato is very interesting and tempting. Yea Srivalli, the kid's school portions are so huge! !Getting her to do the homework and them getting her prepared for the assessment is like I am writing a board exam!! That is one memorable curry. I wish I could get my hands on those small pavakkai. I get the big ones and MIL told me to stuff them and tie them up with kitchen twines..But that is so much work! Very nice. 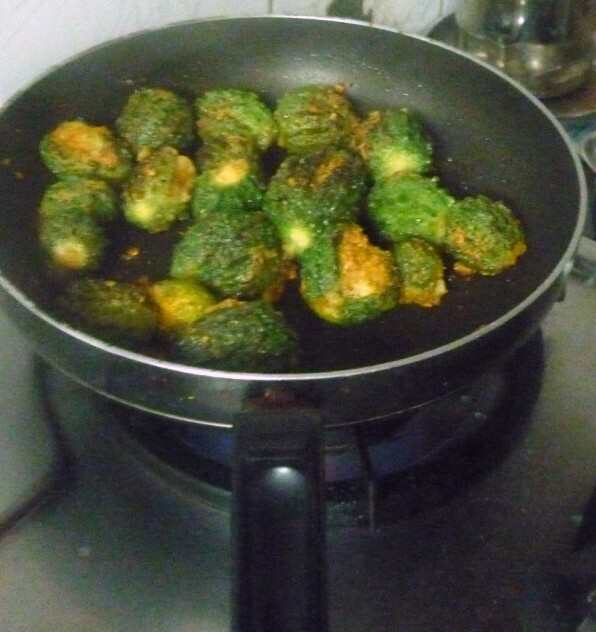 Whatever you do, I don't like karela. I have tried to like them, but it is just not for me.